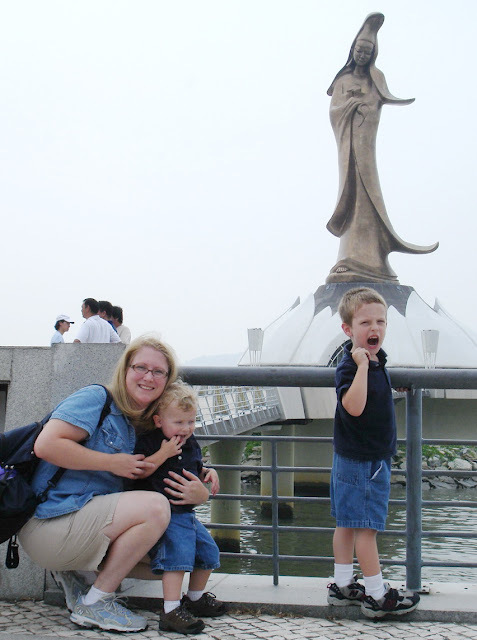 My Wandering Life: Macau or Macao? Macau is frequently spelled two different ways, one ending in U, one ending with an O. So what's the difference? Nothing really. Some sources say that China and Portugal tend to spell it with an O, while western culture ends it with U. I've seen it spelled both ways on businesses, government offices, and transportation. Sometimes it's spelled two different ways in the same document! I spell it with U because that's what the stamp in my passport says. Macau (like many places on the globe) got its name as the result of miscommunication. The goddess of fishermen and seafarers is called Mazu or Matsu, but in Hong Kong she's known by Tin Hau, and in Macau is known as A-Ma. A local legend says that a particularly violent storm was about to drown a fishing vessel when A-Ma appeared and calmed the storm. The grateful fishermen built a temple in her honor and named the bay A-Ma-Gau (or "Bay of A-Ma") in 1488. In 1513, the first Portuguese explorer, Jorge Alvares, came to Macau, and when his crew asked the name of the place, the locals thought they were asking about A-Ma-Gau temple, which the crew heard as "Ma-Gau" which ended up evolving into Macau. There are two large statues of A-Ma in Macau. We caught a glimpse of the largest one today, which sits atop a mountain in Coloane, but we haven't visited it yet. The other one we can actually see from our house, across the water on the Macau Peninsula. We haven't visited it since arriving this year, but going through photos of July 2005, I found one with the boys and I during our visit to Macau way back then, posing in front of it. My how they've grown in the last 6 years! so, you have been there before?... same reason?.. which, by the way, what does your husband do that you have moved there? Six years ago we lived in Hong Kong. My husband was working six-seven days a week, 15-18 hours a day including commute time, and when he finally got a full day off, I booked us a ferry out of the country! We spent about 6-7 hours in Macau seeing some of the biggest sights and eating delicious Portuguese food. My hubby works in entertainment, he's a technical director who specializes in these big overseas productions. I'll write more about the show he's currently working on soon. We moved A LOT, but managed to spend the last five years in the same city, so we're kinda outta practice!